Summer time is salad time. Which is great because I’m not getting home till quite late at the moment and all I’m craving after a long hot walk home is something fresh and light to eat on our small balcony. Add a glass of delicately dry Provençal rose or a tart sauvignon blanc, and the warm light of the setting sun and you have something approaching paradise – or at least as close as you can get in London. I love the city at this time of year, the warm sunlight brings the yellow London brick to glowing life, and it’s when the city’s numerous small, intimate and green gardens and parks really come into their own. Everybody heads outside to share these small spaces, bringing a rare summery intimacy to the long evenings. Add the ever active fox, squirrel and pigeon activity and you have a weird urban-nature cross that I haven’t seen anywhere else. This salad is made for enjoying these times. It’s something I created from what was to hand and it came out really well. Thrown together in a matter a few minutes (podding the beans aside) it has a range of soft sweet and sharp tastes, all melded together by the grassy and fresh taste of good olive oil. Like every good salad, it’s the balance that counts here. It’s important not to over do the strong tastes like feta or onion. It’s why I’ve used spring rather than red onion, and kept the feta down to about a third of a regular block. And it’s an attractive old dish too. The deep verdant green of the beans and luscious tomato red lend it the look of a jewellery box full of glittering gems. Pomegranate seeds would really complete the look. Although they would add another layer of messy faff to the preparation. Because there are no pesky leaves that wilt here, this is salad that can wait for a little while, or be fridged and eaten as leftovers the next day. In an ideal world I would add some freshly squeezed lemon juice, but I didn’t have any to hand. Instead, I used some left over feta that had been out of it’s brine, in clingfilm, for a couple of days. This added a touch of sharp tartness to the salad that balanced the soft sweet tommies and beans. Pod the broadbeans, chuck them into boiling water and boil for 2-3 minutes. Drain and run under cold water until they are cool enough to handle. Squeeze the beans from their skins. You don’t have to do this, but the skins take the edge off the sweet beans and mask their glorious emerald green colours. Chop the tomatoes into large bite sized pieces, finely slice the spring onions and chop the chives. Mix then together in a bowl. Add the skinned beans and finely crumble the feta over the top. Glug over a little olive oil, add a teaspoon of balsamic and grind over some pepper. Gently toss, being careful not to pulverise the beans. *Tis* pretty! I love broadbeans, used to eat them as a snack with beer in Japan. I’m all fired up about British produce having just reread Nige’s Kitchen Diaries. Thanks Sasa! – I’ve tried dried broadbeans before, and they were nice, but fresh – mmm-mmmm, they’re up there with edamame for me. Nige’s Kitchen Diaries are ace – have you read Tender Vol 1? A paean to home grown veg and cooking it. Yum. Hey! This looks great for summer time! broadbeans are so good just now and the colours look so fresh!! Good job! Thanks Gourmet Butcher! They are great aren’t they – so crisp and sweet. And the colours are great – somehow they make it taste even better! It’s definitely salad weather at the moment! That’s all I’m eating for lunch right now so good to get some new ideas in to stop things getting too monotonous. I actually thought the tomatoes were chunks of watermelon when I first looked though. Would that work too do you think? 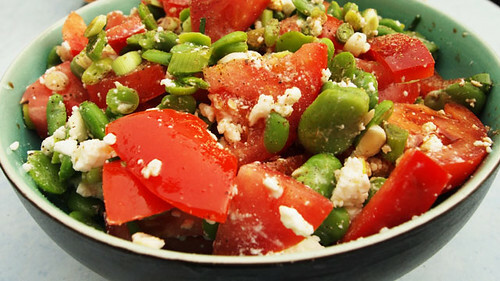 Broan beans, watermelon and feta? In my head it sounds like it would be good, but I’m never sure. @Becca – it is isn’t it! I agree re the need avoid salad monotony. It;s funny, it;s so easy to fall into a salady rut, sometimes taking out lettuce leaves altogether helps you think of more interesting combos – particularly Asian and Levantine ones. I reckon watermelon would work just fine – both watermelon and tomatoes are watery and fresh. The only difference is that tommies are a bit richer. If you were going down the melon route I’d forgoe lemon and definitely have the pomegranate seeds, maybe some pumpkin seeds or pine kernals too. Mmmmm. Sounds good to me.